You could say that SM East dominating the league on its way towards another conference championship is just maintaining the status quo. Nobody really expected the Lancers to drop off and give up the pace to some other team. That said, who all expected anything out of SM North than the respectable 6-5 record that they ended up with? I didn't see the Indians winning it all simply because they had (arguably) the league's best QB in Will Schneider, but I definitely expected him to counterbalance the atrocious defense that gave up a staggering 39.9 points per game. Considering both coaches more or less met expectations, I'll take the coach that won both head-to-head matches this season. It'll be extremely interesting to see how SM North will live without one of the biggest impact players in school history. This race was actually a lot closer than I anticipated. After compiling some stats, Trey Moore was an absolute beast for Lawrence as he trucked his way through defenses for 1291 rushing yards and 19 touchdowns. If Moore hadn't been injured early into the team's 49-52 loss to SM North in the state quarter-finals, I wouldn't have been surprised if the game had ended very differently. Despite Moore's impressive stats, you can't really deny a player who has done his best to carry his entire team to their first winning season since 2004 and a nice playoff run like Will Schneider. The senior QB accounted for 70% of the team's total yards; combine that with his 43 touchdowns (31 passing, 12 rushing) and you have easily one of the most entertaining players to watch in the league and one that we may never see again. It'll be very intriguing to see how the Indians even begin to tackle replacing such a dynamic player. So I just looked at the stats for SM East while finishing this article and I honestly thought I saw a typo in the Rushing department. The Lancers had 4,479 total yards on the ground as a team which isn't abnormal for a team running the flexbone. What is abnormal is when 2,936 of those yards are split almost evenly between two players. That is exactly what happened this year for both Nigil Houston (1,484 yds, 19 TD's) and Milton Braasch II (1,452 yds, 23 TD's). Both players rocked opposing teams one the ground and Houston even snagged two TD passes as well, bringing his total even closer with 21. You could make a case for either player winning the award considering their accomplishments, but Houston had that level of production with 72 less carries. He averaged a staggering 13.02 yards per carry while compared to Braasch's 7.81 average which is still very impressive considering he had 186 attempts. There may have been some other impressive offensive players this season, but these two managed such amazing numbers while splitting carries and that shouldn't be ignored. Naming a DPoY is difficult considering how hard it is to track defensive stats at the high school level. However, Isaiah Wright's four INT's stands out on the stat sheet. He also managed to take one of those back for a touchdown. The kicker? He's a sophomore. Wright managed to collect almost half the team's turnovers and became a force to reckon with as the season went on. It'll be fun to see him progress over the next two seasons and see how far he goes with the Lancers. While I wouldn't say Moore had the most stand-out season historically considering the style of offense ran by the Lions, he more than covered for last year's star running back J.D. Woods. It would be a lie to say this year's squad never skipped a beat, but Moore did a respectable job of shouldering a team that was missing one of the best trio of players since Olathe North's '09 squad. While senior RB Marcos Garcia had a respectable season last year, it was definitely impressive for him to improve his production and become a perfect complimentary piece to MVP Will Schneider. Garcia managed 967 yards and 11 touchdowns on the ground and helped SM North truck through the middle of their schedule with three 100+ yard games in a row. 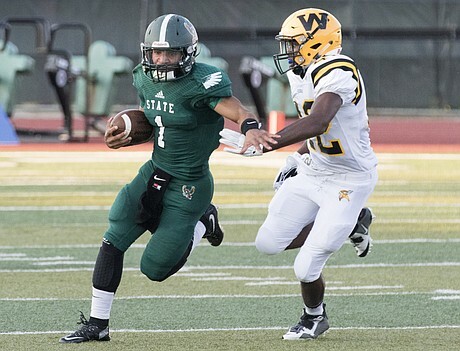 Even though he had a blast of a game against SM Northwest where he ran for 259 yards and three touchdowns, his best game came when it truly mattered, as he gashed Lawrence High for 181 yards and two touchdowns in the shootout. 1. 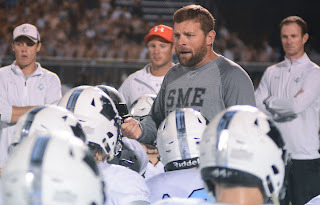 Shawnee Mission East (10-2) - They may have lost to their two non-conference opponents (by a combined seven points), but the Lancers showed they're still at the top of the food chain with their third semifinals berth in four seasons. Coach Delaney needs to make sure to keep his team hungry for another state title in order to keep this run going for SM East. nicely since they're realignment in 2014. Photo by LJWorld. 2. Lawrence Free State (9-3) - You gotta admit that the Firebirds have done an extraordinary job of taking on the West side of the playoff bracket as of late. They still need to find a way over the mountain of a hump that is Derby, but wins over Garden City (9-1) and Washburn Rural (7-4) can't be overlooked. Free State has a fun playing style to watch and that should remain true come next season. 5-4. The main story will revolve around replacing the team's offensive pieces as they try to at least approach the same level of production. A pair of sophomore receivers will return with both Billy Conoway (963 yds, 6 TD's) and Noah Laird (810 yds, 9 TD's) coming back, so the newcomer at QB won't be without any weapons. 4. Lawrence High (6-4) - The Lions showed a strong fight to the very end, but came up short in the big games when they came around. They have managed to reloading pretty consistently over the last half-decade, so we'll have to see who is next in line after Trey Moore's graduation. Junior QB Dante Jackson was successful on the ground in his own right, so the next in line at running back will have good company in the backfield. SM West had a respectable season despite a dissapointing end. 5. Shawnee Mission West (6-4) - This team started out the season with state title ambitions and seemed to keep those expectations going up until a couple losses in the middle of the season brought the Vikings back down to Earth. 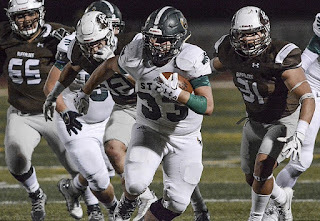 SM West went through the season quietly beating the teams they were expected to beat and even snuck in a 41-40 win over Free State while they were still adjusting to new offensive playmakers. That said, the Vikings never really threatened when in the underdog position and that showed best in 19-49 defeat to Lawrence and a 0-57 shutout against SM East. SR QB Zach Witters showed immense promise by carrying the team through the first half of the season, but when Witters slowed down, the entire team paid the price as nobody managed to truly supply support as he still managed to lead the team in rushing with 639 yards. JR RB Kirby Grisby will hope to improve this off-season so as to become the next impact player for the Vikings. 6. Olathe South (4-7) - Say what you want about the Olathe School District, but Olathe South showed they were the best of the pack... I guess. The Falcons were the only Olathe school to advanced past the first playoff round and put up a decent fight in their 35-49 loss to Blue Valley, the eventual state runner-ups. 4-7 may not be where a team wants to be, but you can't say the Falcons didn't give there best at the end of the season. 7. Olathe North (3-6) - Well, that season kind of sucked. The Eagles did enough to prove they weren't at the bottom of the barrel by taking out the Falcons, Ravens and Cougars; teams with a combined 8-21 record. The team showed a little life against Wichita Heights (9-2) and SM West, but they never managed to correct the small mistakes and find what was holding them back. The team will hope to build around SO QB Zac Krause, who had some impressive plays despite the expected mistakes of a young player. He will have a decent competition for the spot with fellow sophomore and former starter Mason Myers who showed his own talents on the ground. Another year in the flexbone offense may be the defining factor for this team. 8. Olathe East (3-6) - It's always difficult to pinpoint what direction the Hawks are going in since their fall from glory after the firing of long-time coach Jeff Meyers after the 2014 season. But, things seem like they may be improving with the return of both JR QB Will Scofield and SO QB Hunter Thomas. Both players have game experience and a nice competition can be expected. The team will also see the return of their top three rushers. They will also be returning their top five tacklers, two returners with KOR touchdowns, and three players with two interceptions a piece. 9. Olathe Northwest (3-6) - If you're looking at scores as a defining stat for ranking these teams, the Ravens probably wouldn't be this low. The team lost five games by seven points or less, including a 14-20 OT loss to Olathe East and 14-17 loss to Olathe North. The Ravens struggled to close out games but are by no means a bad team. However, they were the only team to go winless in the Olathe District rivalries and it wouldn't be fair to put them above the two teams that beat them when the accomplishments really aren't that different at the end of the day. 10. Shawnee Mission Northwest (1-8) - They're not the worst team in Shawnee. They proved that when they beat SM South 36-22. It's never easy to rebound from bad seasons, and coach Bo Black is still looking for answers. Hopefully he'll have the chance to find them in the 2017 season. 11. Leavenworth (1-8) - Well, it seems we're back to square one. The Pioneers managed a win over SM South to put themselves in the same spot as SMNW. Leavenworth's position is a unique one which makes improvements in football difficult, but you never know what they might come up with next season. 12. Shawnee Mission South (0-9) - Leavenworth has always had numbers problems in football, but I'm not sure if they've had issues as bad as SM South, a team who had only 24 players on the varsity squad. It certainly didn't help when multiple starters left the team in protest of another being kicked off. Unless they're raising some hidden monster in the science labs, I don't see much improvement for coach Oberzan or whoever ends up coaching the team next season.